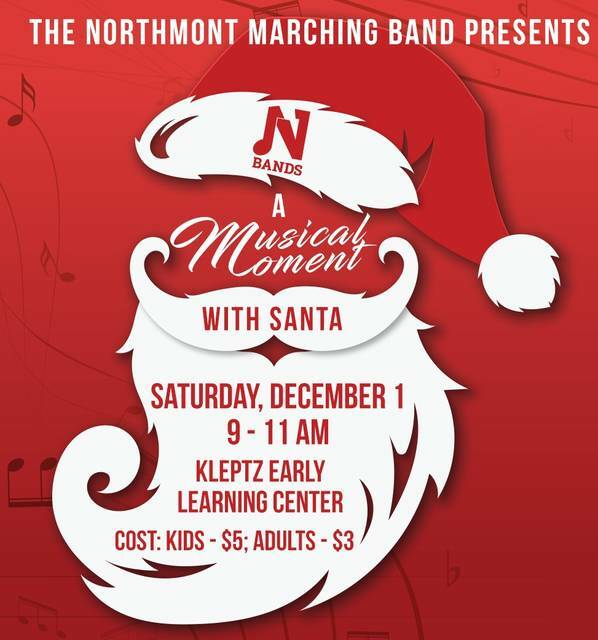 ENGLEWOOD — Please join the Northmont Band for ‘A Musical Moment with Santa’ on Saturday, December 1 from 9 to 11 a.m. at the Kleptz Early Learning Center, 1200 W. National Rd. Admission is $5 per child; $3 per adult (payable at the door only). * Make your own musical instrument and play with the Northmont Marching Band. * Introduce your children to musical instruments with the district’s music teachers at the instrument petting zoo. * Sing Karaoke with the Northmont A Cappella groups. * Visit with Santa and get your picture taken. A picture will be given to you (included with admission price). * Santa Raffle – enter the free raffle for a private visit from Santa in your home!